Championship leaders Burnley have got off to one of their best ever starts as they begin their quest to the Premier League. They’ve taken 34 points from their first 15 games and are currently on an 11 game unbeaten streak. The whole squad have been extremely impressive but there are two stand out players, whose partnership and form has been unstoppable; Danny Ings and Sam Vokes. Ings is the current top goal scorer for Burnley and is second in the league only to Leeds United’s Ross McCormack. Ings has been in inspired form and after recently grabbing an important equaliser against Championship new boys Bournemouth; it takes his current league total into double figures. Since being released from Southampton at a young age, Ings’ career has gone from strength to strength. In 2009 he made his professional debut for Bournemouth and has since moved onto current club, Burnley. However disaster struck for Burnley’s new man, as within weeks of him signing, Ings suffered a tear in his knee cartilage and was forced out for 5 months. Upon his return, he found himself remaining on the bench due to the form of, recent England call up, Jay Rodriguez. In the summer of 2012, Rodriguez departed the club to join Premier League newcomers, Southampton. This gave Ings the chance to show his worth but once again disaster struck as he tore the knee cartilage in his other leg and this time was out for 6 months. When he returned, another striker, Charlie Austin, had shut the door on his shot at first team action and was once again not given the chance. It was not until a recent transfer from Austin that left the 21 year old relishing the chance at first team football. Manager, Sean Dyche, decided against bringing in a replacement and kept faith in the young England international and has since been rewarded. Danny Ings is in the form of his life and at the age of just 21, you feel as though his best may still be yet to come. 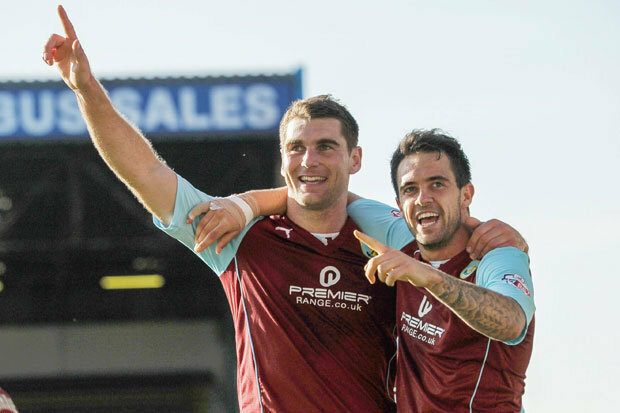 However, Ings has not been alone and has been assisted by Welshman, Sam Vokes. Vokes has also been on top form and with 9 league goals to his name while being only 15 games in, him and Ings will be confident of both reaching the 30 goal mark before the season is over. Like Ings, Vokes began his footballing career in Bournemouth, grabbing 16 goals in 54 appearances for The Cherries. He made a move to Wolves in 2008 and after several loan spells, including Burnley, he signed a 3 year deal with the Championship side. Soon after making the move he found himself second best to the likes of Austin and Paterson and, likewise to his current strike partner, found himself sat on the bench week in week out. Nevertheless, Vokes decided to stay with the club and after the recent departures of Austin and Paterson, he has been given the opportunity to feature which he has grabbed with both hands as he looks to become one of the most prolific strikers in the league. With Burnley looking stronger every game, the attacking presence of Ings and Vokes will strike fear into the opposition’s defence. With The Clarets eyeing up promotion, the fitness of the pairing could be vital if they still wish to reach the Premier League. Previous articleDiamond in the rough or just rough? The curious case of Nile Ranger. Next articleAre Bradford City Really A One-Man Team?